I feel like I'm caught in limbo right now. In two weeks I'm retiring from working at the University of Chicago for the past 27 years. And I'm looking forward to it. My first task will be to have some revision surgery on my replacement hip. I just can't seem to get past that, to see what else the future will bring. I'm looking forward to having time to clean and clear out. In the long term that will mean I'll have better access to my supplies, know what I have and where it is, get rid of things I know I will not do, and I'll be able to do better work, I hope. Perhaps move in new directions. 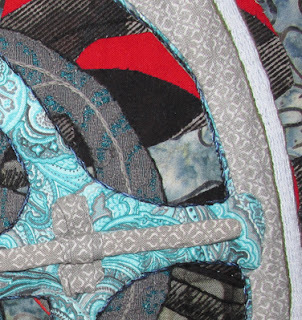 In the short term, I suspect it all means that actual stitching by me will be in short supply. I'm not sure what kind of routine and schedule I'll work out in the end. 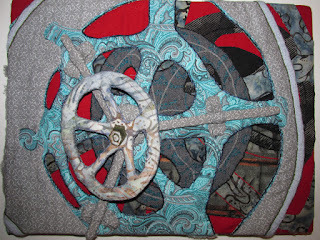 So, for now I'm going to take a blog break and give myself time to work through the transition and see where I end up. I suspect it's likely to be back here. Thank you very much for reading my blog and for all of your comments and support. I began this blog in May 2010 and this is the 1018th post. 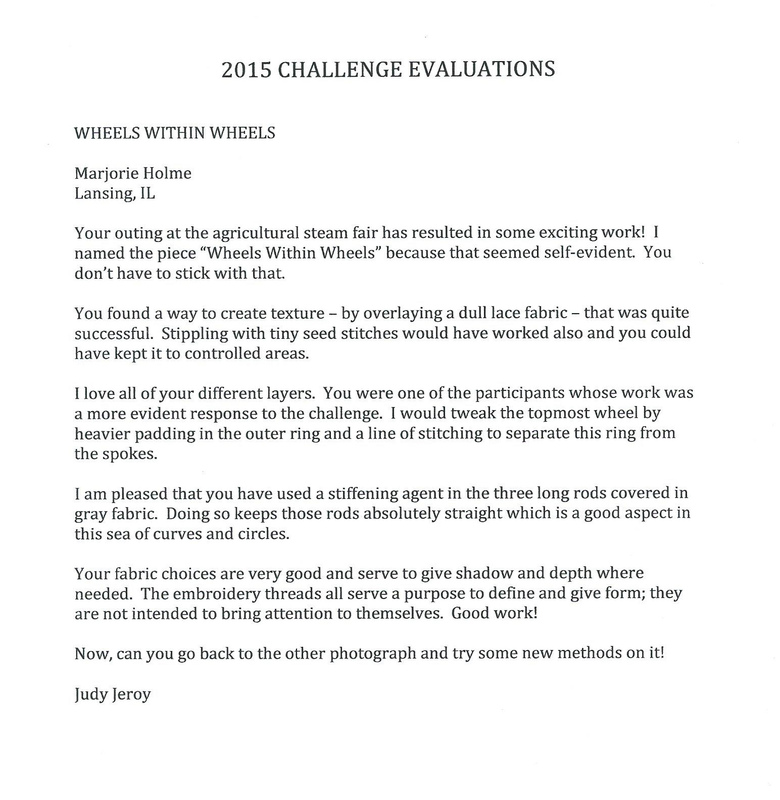 As was my experince last year, my finished challenge piece came back quickly with a lovely note. 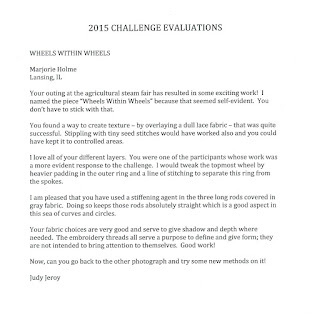 I'm already looking foward to next year's challenge. Since I sent off the EGA Challenge piece, I've not been working seriously on anything. We have been having fun vising local galleries on weekends. 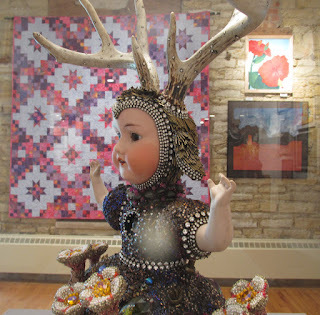 Last weekend we visited the Illinois State Gallery in Lockport. 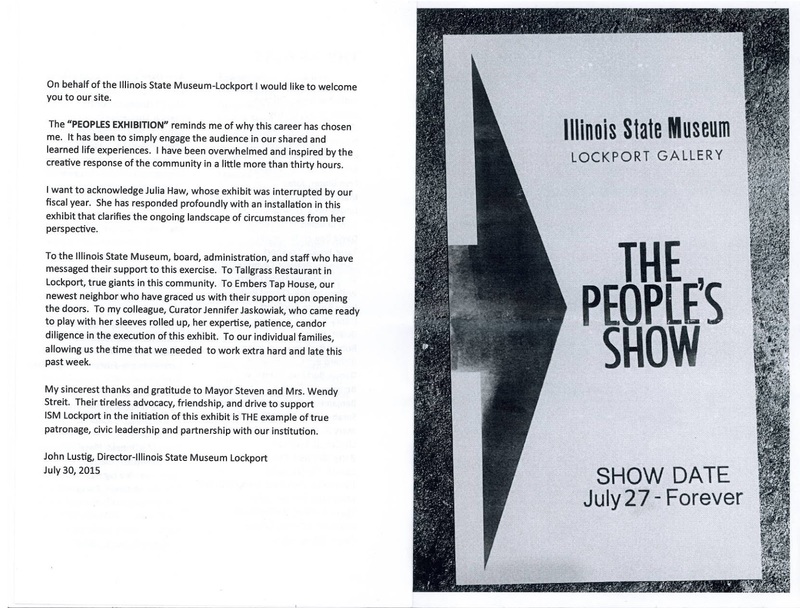 There's a really exciting show there, thanks to local artists and the city of Lockport. And No Thanks to the Illinois state government. Governor Rauner wants to close all of the Illinois State Museums. A few short years ago when this issue came up, there was huge public outcry and they did not close. This time--silence! The show is really wonderful. The state cancelled the insurance for the galleries, which means they had to take down the (just installed) regular show. 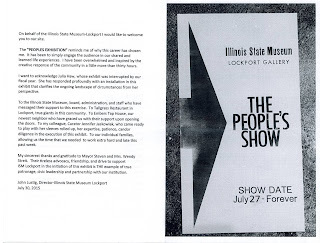 Lockport's mayor stepped in and added the gallery building to the city's insurance. A call went out to artists for works and, as you can see below, they got wonderful response. This flier explains about the show. Here's another photo. The gallery is set to "go dark" on September 30th; the employees have been sent layoff notices. The show is full of such good energy and well worth a visit. 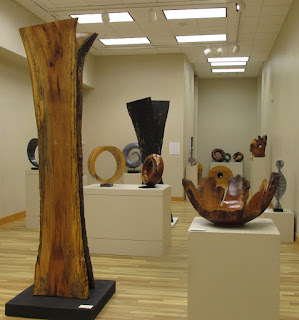 This weekend we headed east instead of west and visited Valparaiso University's Brauer gallery. They have a thought provoking exhibit on friendship dolls that were exchanged between America and Japan both before WWII and continued more recently. The dolls are very sweet and the descriptions had me looking at them very carefully. The exhibit documentation also discussed issues in care and conservation of material objects from different perspectives. My husband is enjoying the friendship dolls. They are surprisingly large. The little things in the case to his right are the doll's accessories--including a full tea set, hand-made fans, shoes, lacquer trunks, and sweet sewing boxes. 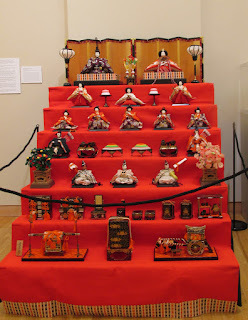 This is a traditional display of dolls set up for Girl's Day each year---the Emperor and Empress are at the top, and each layer is a bit lower in status. The third layer is musicians with instruments. The display explores dolls in Japanese culture and Japanese culture in the west. 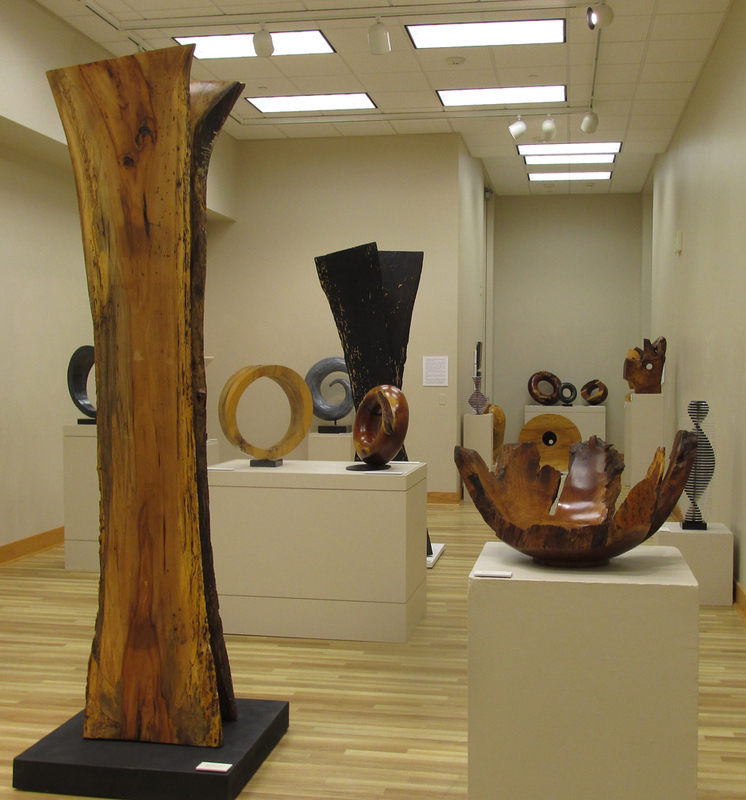 This sculpture display is also at Brauer. 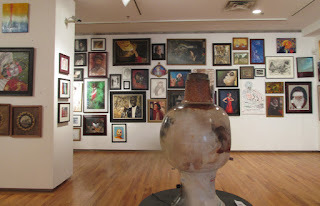 The exhibits close December 13. I finished the back of the EGA Challenge by covering the back and edges of the mounting foamcore with a dark coordinating fabric, hand stitched all around. I like the "finished" look of it, even without a frame. Not really noticable here, except as a thin dark line around the edge. I mailed it off to Judy Jeroy yesterday. 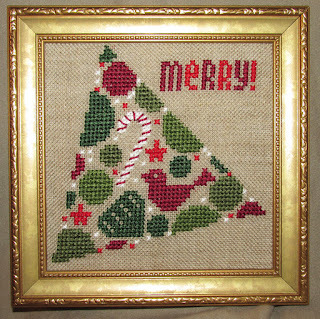 I stitched this holiday design a while back and a friend gave me the perfect frame. 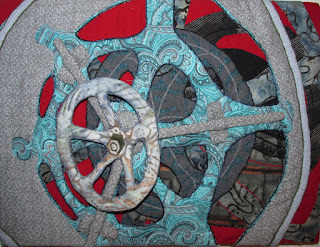 I finally got it all together and laced the linen to a piece of mat board and put it in the frame. I backed the frame and added a small sawtooth hanger. I got down to work and have completed the stitching on the EGA challenge piece. I've begun mounting it on foamcore. 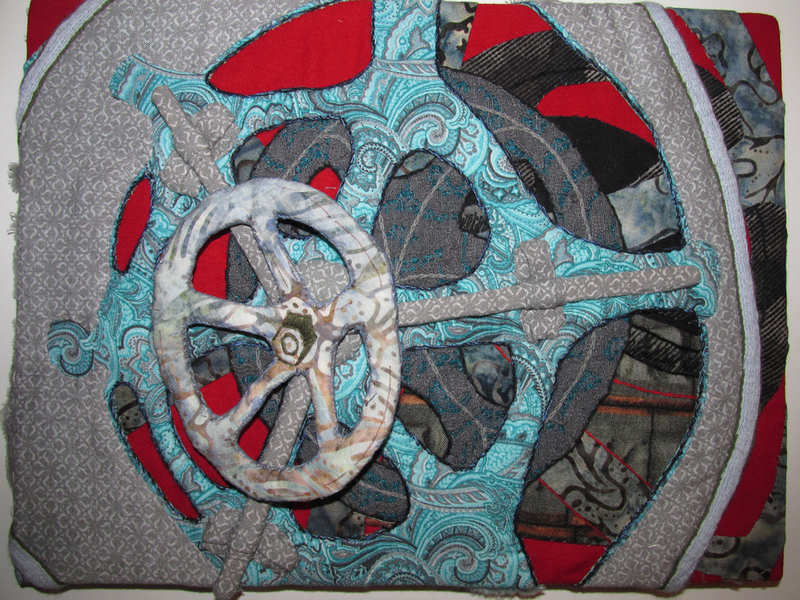 All I need to do now is add the backing fabric and personal information and I can send it off to Judy Jeroy. Here it is. 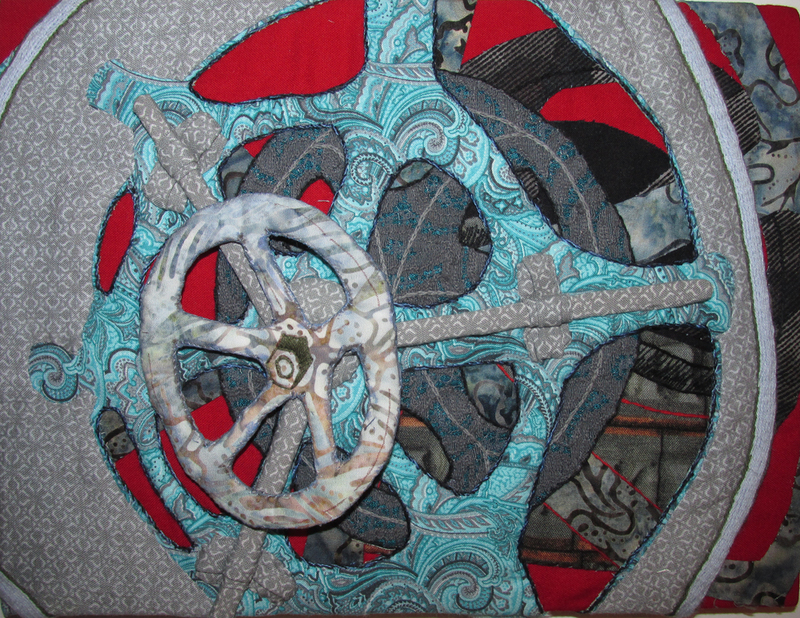 The top wheel is a detached stuffed shape. It took me a while to figure out how to stitch and stuff the complex shape. 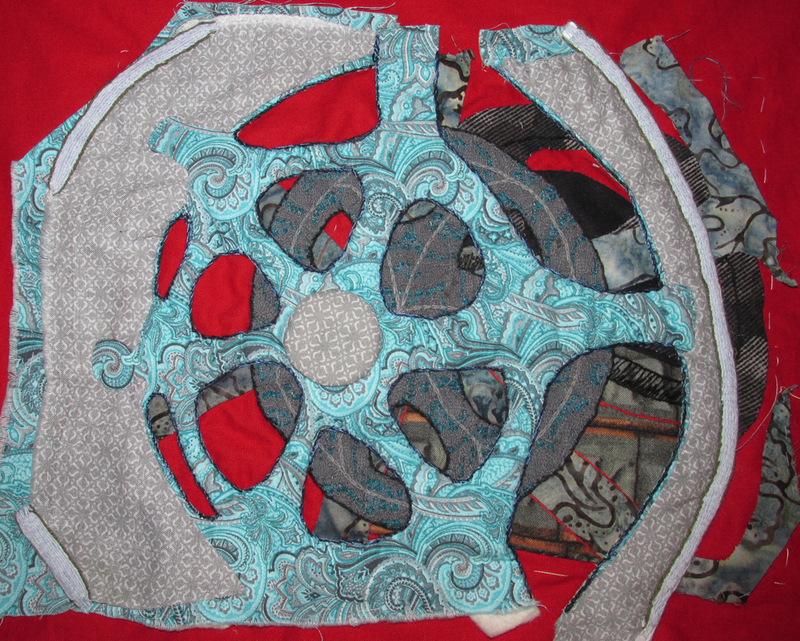 I ended up cutting the top layer from fabric, adding two cut layers of batting to it and then basting the top seam allowances to the back of the batting. 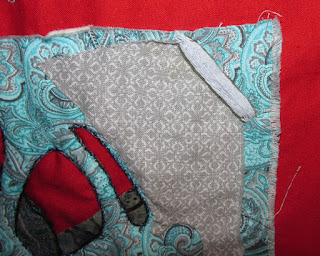 Then I cut a backing piece, folded in the seam allowances, and hand stitched it to the prepared top piece. 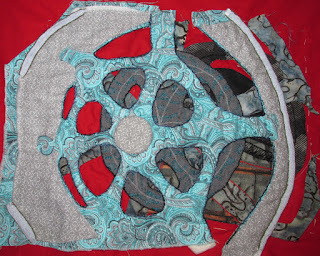 That sounds more organized than it was--there were some tiny seams and clipped curves and I just made it up as I went along. 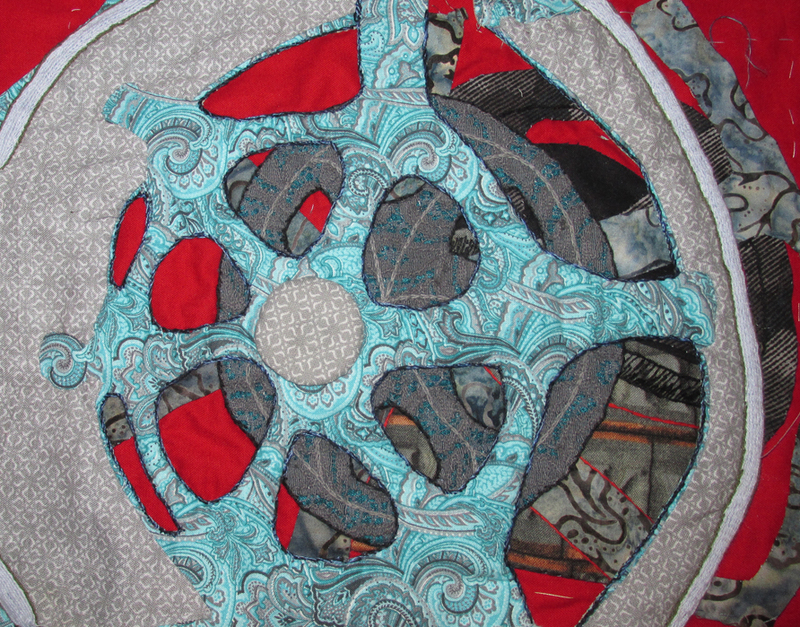 There were so many layers and then the wooden sticks for the rods, that I ended up gluing the top wheel to the piece. I couldn't sew it on invisibly or neatly. And another cropped view of the whole--without the ragged edges showing. 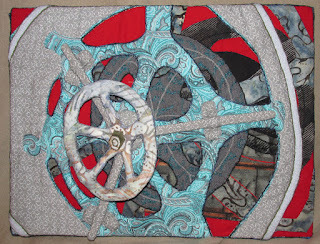 This past week, stitcher and designer Judy Souliotis passed away. I was very sad to hear this news. She was a wonderful designer and teacher. Several years ago I took a wonderful class with her at the Chicago ANG retreat at Donaldson. 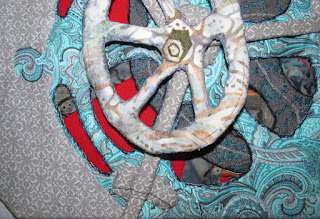 All Au ver a Soie silks and Kreinik metallic threads on black canvas. This is the piece and it was an amazing class. Judy had added gold leaf and gold paint to the canvas and placed some beginning design lines so everything fit perfectly--a ton of work for a large class. 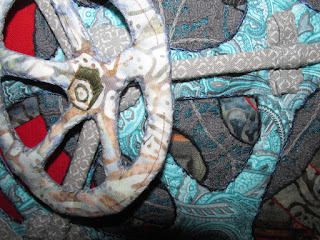 She was so enthusiastic about the ideas, techniques, stitching--the class was vibrant and alive. 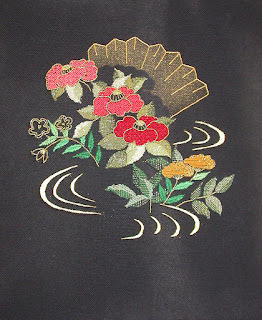 For me, I loved the needlepoint with a Japanese twist--the design has a Japanese influence and some of the techniques are based on those in Japanese embroidery. 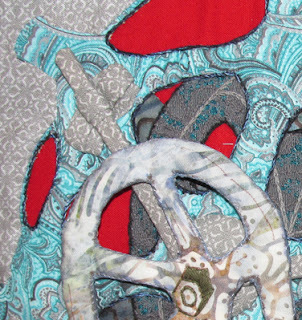 I learned so much in this class about color and color placement, working with metallics, working with silks, working on black canvas, couching techniques...and that's just off the top of my head today years later. I finished the piece in 2010 and I'm very pleased with it. I realized that the challenge ends Sept 1st and I need to get moving! I decided to stitch the rim on the large wheel using raised stem stitch. 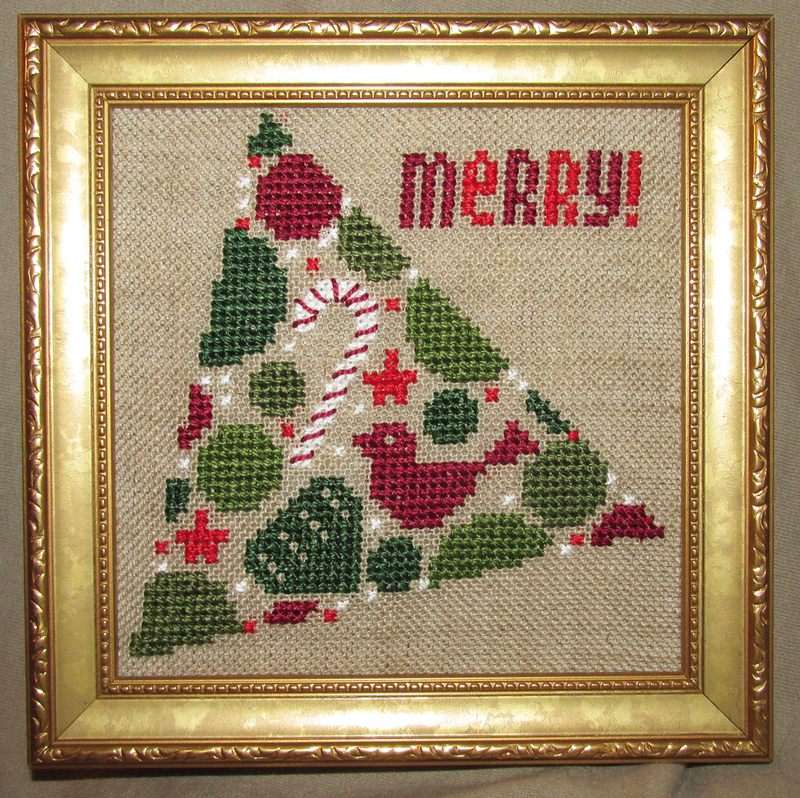 I had stitched on some batting to pad it, but realized that was a mistake--it was too easy to catch in the needle. 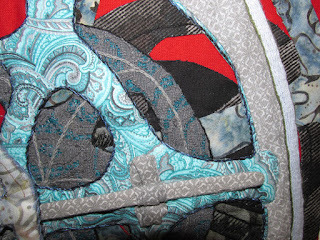 For raised stem stitch you don't go through the fabric, but skim the surface to make the stitch. Above is my first bar--most of this will be off the edge of the picture, so I'm going to leave it as is, even though I'm not thrilled. 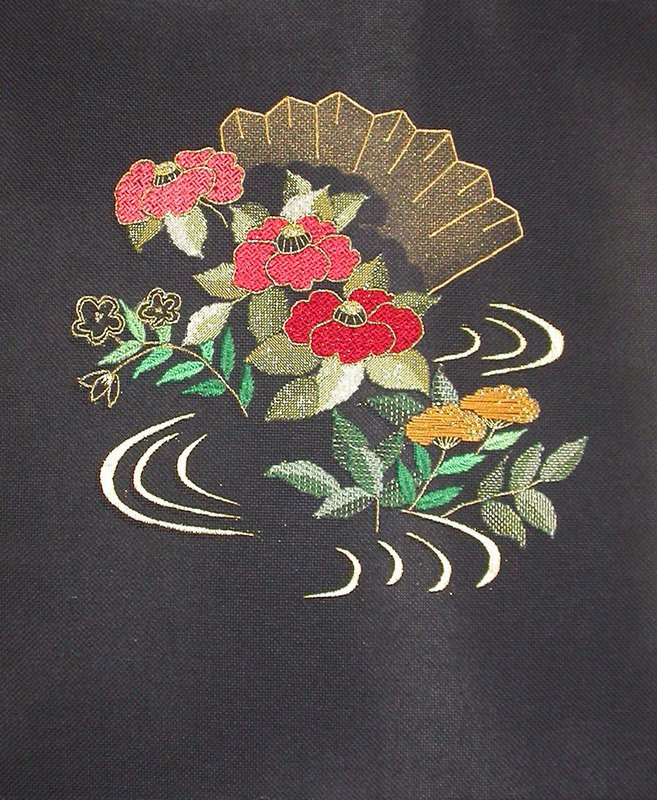 I did learn a lot about doing the stitch. For the second band, in the upper left, I removed the batting and stitched over a piece of paper. That worked much better. For the long band on the right, I left the batting but added a piece of paper on top of it so I have the padding but could also stitch without catching it. That worked very well. 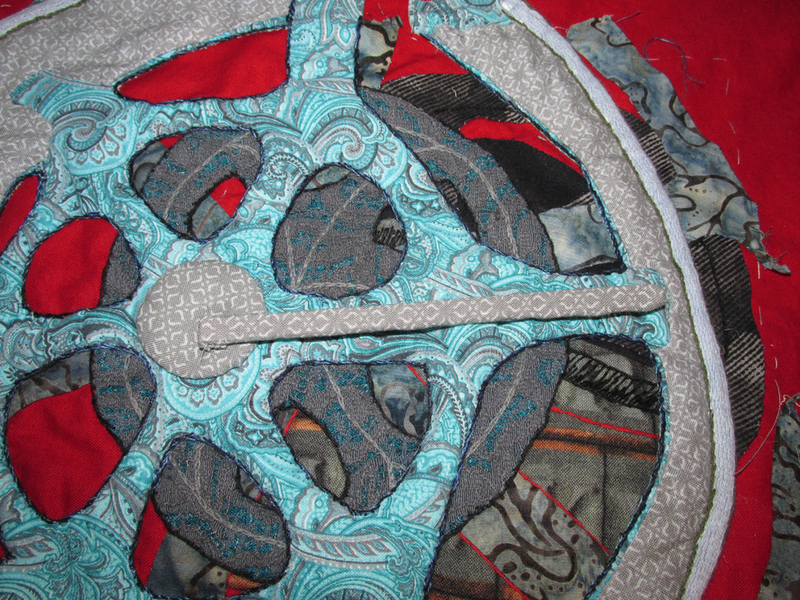 I've also added a circle in the center--part of the next layer of these articulated arms that come out of the center. I cropped this picture (above) to the edge, just to see how it looks at this point. And here's a hint of my plans for the next step. I'm covering wooden coffee stirrers with fabric to make the articulated arms. I've decided that I need to give the piece a good pressing before adding these more dimensional elements and I haven't been home yet this week to do that.